This page is about the Japanese medium tank Type 74. 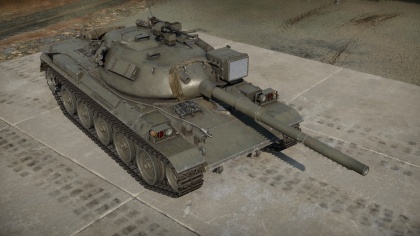 For the premium version, see Type 74G. The Type 74 is a Rank VI Japanese medium tank with a battle rating of 8.7 (AB/RB/SB). It was introduced along with the initial Japanese Ground Forces tree in Update 1.65 "Way of the Samurai". Suspension wheels and tracks are both 20 mm thick. The Type 74's hydropneumatic suspension means it could vary the sloped angle of its armour towards the enemy. Hull roof is rated to be 25 mm effective against HE. .50 cal machine gun proves useful against SPAAGs, as well as strafing aircraft. Better frontal armour overall than the Leopard, ZSU-57-2 will have a much harder time killing you from the front, can also bounce some APDS. Hydropneumatic suspension system takes time to deploy and undeploy. Only -5° of gun depression without deploying the suspension. 53 kph maximum compared to Leopard 1's 65 kmph (however both tanks rarely reach this speed). A year after the Japanese Ground Self-Defense Force (JGSDF) issued out their first post-war main battle tank, the Type 61, development started on its successor, recognizing that the Type 61 was already becoming obsolete in terms of the new Soviet tanks being produced such as the T-62. Working alongside Mitsubishi once more, they looked for a new tank design incorporating many new features introduced in tank technology. This resulted in the tank having the hydropneumatic suspension system from the U.S.-German project MBT-70, a hull shape similar to Germany's Leopard 1, and the powerful 105 mm L7 gun for its main armament. Other planned features for the tank was a rotatable commander's cupola and an autoloader system for the main gun. The first prototype arrived for testing in 1968 as the STB-1. Modifications to the design started in 1969, which saw the autoloader removed for being too complex and expensive, as well as the removal of a proposed remote-controlled anti-aircraft machine gun for the same reason. The turret design was also elongated for various design purposes. The modified prototype was labeled STB-3 and was delivered in 1971. The final prototype, STB-6, was then delivered in 1973. The tank was then accepted for service in 1974 as the Type 74 tank. Production would start in September 1975 all the way to 1989, producing 893 tanks. Due to the defensive nature of the JSDF and the absence of any hostility rising out of the Cold War, the Type 74 spent its service life in the JGSDF with no battle service. During its service life however, it was upgraded with new hardware such as infra-red imagers for night fighting and a laser rangefinder for the commander. Despite all that, the Type 74 was generally outdated in terms of specifications even before entering service, as second-generation main battle tanks like the Chieftain and T-72 outclass it and development for third-generation main battle tanks like the Leopard 2 and M1 Abrams were already underway. The tank was to be replaced by the newer Type 90 main battle tank, but the collapse of the Soviet Union and the official end of the Cold War caused the replacement program to be halted. 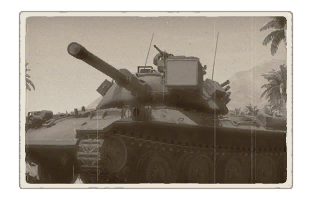 Today, the Type 74 still sees limited service in Japan and it was reported that 700 units were still in use in 2006.